RK Water specializes in water conditioning and treatment for steam boilers, open condenser and closed-loop systems. We also perform cooling tower maintenance and filtration system installations. In addition, you can rely on us for laboratory water analysis and money-saving water utility audit and rebate programs. Silver Bullet™ Water Treatment System Our exclusive Silver Bullet™ Water Treatment System is an innovative and patented alternative to treat condenser water. Its Advanced Oxidation Process (AOP) is a proprietary technology that creates a processed gas from ambient air that is injected directly into the water matrix. When the gas contacts the water, several reactive oxygen species emerge that assist with microbiological control. By safely cycling up the water into an alkaline state, the water becomes less corrosive. Traditional Chemical Water Treatment Condenser water treatment, comprised of chemical additives, to control scale and corrosion and inhibit microbiological growth. Chilled water loop treatment: We apply chemical treatment on the closed chilled side of a recirculating cooling system to prevent scale, corrosion and microbiological growth. Heating water loop treatment: We apply chemical treatment on the closed heated side of a recirculating heating system to prevent scale, corrosion and microbiological growth. 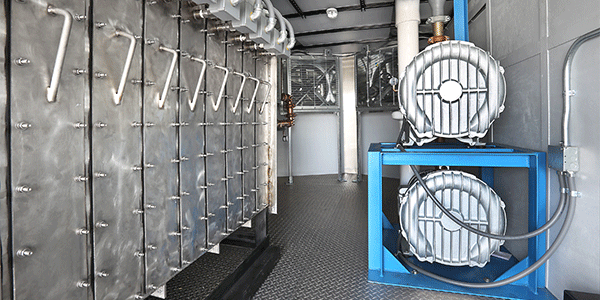 Steam boiler treatment: Prior to initial firing, boilers are inspected on both the fire side and water side. All valves, nozzles, baffles, water columns, cutoffs and other components are checked and adjusted for proper operation. Dirt, grease and other impurities are “skimmed” off the water surface to ensure smooth start-up. Makeup water pre-treatment: We perform softening and other treatments to makeup water to improve system performance. Water testing and analysis: Complete analysis on makeup, open-loop and closed-loop water systems. Microbiological testing: Testing for bacteria, algae and other microorganisms common in water systems. Independent corrosion coupon testing: Lab analysis of metal coupons for corrosion. Independent Legionella testing: Lab analysis of water samples for Legionella bacteria. Copper and iron analysis: Testing for iron and copper in both makeup water and system water as a method for measuring potential corrosion. Corrosion coupon rack installation: We install coupon racks in open condenser water loops. Water treatment equipment installation and repair: Installation and repair of conductivity controllers, bleed-off valves, metering pumps, chemical feeders and more. Cooling tower cleaning and repair: Leak repair, paint and epoxy coatings, basin and strainer cleaning, wet deck replacement and cleaning, pump and spray nozzle replacements, sweeper maintenance and more. Customized training: On-site training and education for your facility staff by our team of experienced representatives on all aspects of water treatment, maintenance, troubleshooting and repair. Filtration system installations: Filtration of organic and inorganic particles or suspended solids up to 50 microns. The removal of these “solids” supports a clean and efficient running system. Heat exchanger cleaning and service: Cleaning, inspection and service on shell and tube, plate and frame, and many other types of heat exchange equipment. Water Utility Audit and Rebate Program: We show you ways to save on water and assist at implementing treatment programs that qualify for municipal rebates. Legionella Risk Management: We provide Legionella testing and solutions to bring your water system into compliance with ASHRAE 188-2015.